Portuguese philosopher; lived in the thirteenth and fourteenth centuries. Steinschneider believes him to have been the father of the astronomer Jacob Poel. Ibn Bilia was the author of many works, the greater part of which, no longer in existence, are known only by quotations. 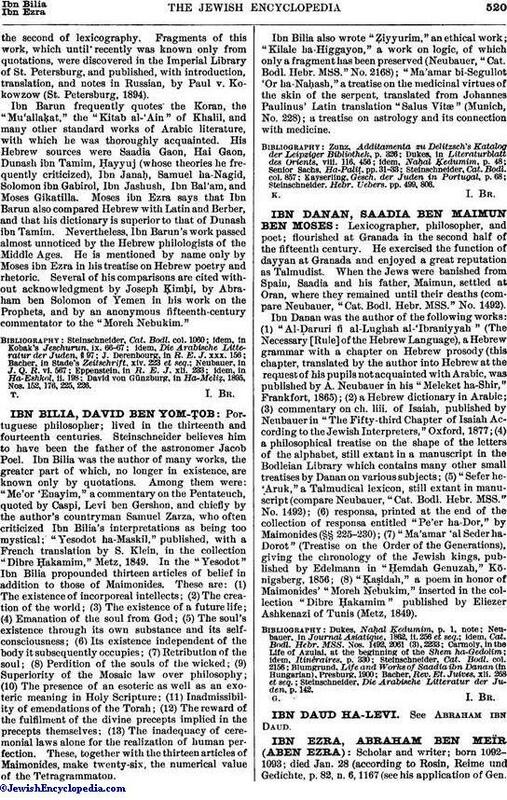 Among them were: "Me'or 'Enayim," a commentary on the Pentateuch, quoted by Caspi, Levi ben Gershon, and chiefly by the author's countryman Samuel Zarza, who often criticized Ibn Bilia's interpretations as being too mystical; "Yesodot ha-Maskil," published, with a French translation by S. Klein, in the collection "Dibre Ḥakamim," Metz, 1849. In the "Yesodot" Ibn Bilia propounded thirteen articles of belief in addition to those of Maimonides. These are: (1) The existence of incorporeal intellects; (2) The creation of the world; (3) The existence of a future life; (4) Emanation of the soul from God; (5) The soul's existence through its own substance and its self-consciousness; (6) Its existence independent of the body it subsequently occupies; (7) Retribution of the soul; (8) Perdition of the souls of the wicked; (9) Superiority of the Mosaic law over philosophy; (10) The presence of an esoteric as well as an exoteric meaning in Holy Scripture; (11) Inadmissibility of emendations of the Torah; (12) The reward of the fulfilment of the divine precepts implied in the precepts themselves; (13) The inadequacy of ceremonial laws alone for the realization of human perfection. These, together with the thirteen articles of Maimonides, make twenty-six, the numerical value of the Tetragrammaton. Ibn Bilia also wrote "Ẓiyyurim," an ethical work; "Kilale ha-Higgayon," a work on logic, of which only a fragment has been preserved (Neubauer, "Cat. Bodl. Hebr. MSS." No. 2168); "Ma'amar bi-Segullot 'Or ha-Naḥash," a treatise on the medicinal virtues of the skin of the serpent, translated from Johannes Paulinus' Latin translation "Salus Vitæ" (Munich, No. 228); a treatise on astrology and its connection with medicine. Steinschneider, Hebr. Uebers. pp. 499, 806.